Arm wrestling is a serious, highly-competitive international sport that is growing in popularity every day, but the United States has lagged behind Europe in the competitive scene. The UNITED ARM WRESTLING LEAGUE seeks to change that. We are an international arm wrestling league that organizes tournaments, cultivates community, and promotes the sport across the United States and around the world. There are many other arm wrestling leagues and organizations out there, but very little prize money. Our goal is to gain 5,000 - 20,000 active members and fund cash prizes for our arm wrestling tournaments. With an established prize pool, arm wrestlers will be able to start making a living from their sport. There will be a cash prizes for the participants with the most points in each class in both professional and amature divisions at the end of the arm wrestling competition season. Together, we are stronger. Part of our mandate is to support other organizations and help other arm wrestling leagues thrive. We invite organizations to join our league and sanction their tournaments. Members will be able to participate in our rankings and points system, and your tournament will have access to one of our monthly prize payouts to award. As the host of a U.S. event, you will keep all tournament entry fees with the exception of 15%, which will go back into the membership to support Team U.S.A. all sanctioned tournaments will be officiated by certified officials. 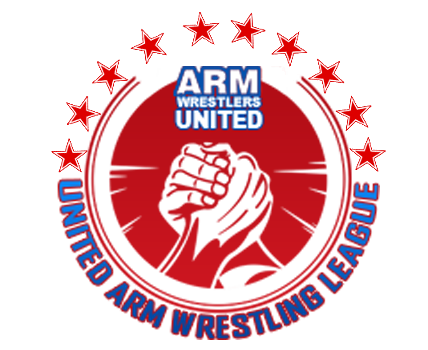 The UNITED ARM WRESTLING LEAGUE has big plans for the future. We are currently seeking sponsors who would be willing to support our organization and provide discounted merchandise to our members involved in the arm wrestling competitions. We also plan to host a yearly banquet following the national championships, recognizing the top arm wrestlers and officials in the sport. This includes arm wrestler of the year (professional division and amateur division), sportsmanship award, match of the year award, rookie of the year, etc. One of our goals is to raise enough money to support U.S. team in the world championships.